At St. Mary Church Charlestown, on March 25th at 3:30, distinguished organist Heinrich Christensen, pianist/choirmaster Daniel Sauceda, and the Charlestown Community Choir will offer music from Bach’s meditations on the Palm Sunday liturgy. 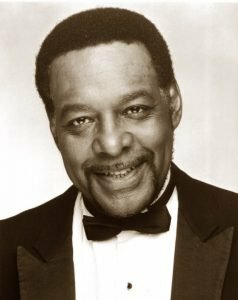 Soprano Sirgourney Cook and baritone James Dargan will intone two of the most powerful arias from Bach’s Passion music and in memory of the late Robert Honeysucker, will offer African-American spirituals evoking the suffering of Jesus and mankind. The historic 1892 Woodberry and Harris tracker organ will peal out in support of this profoundly moving concert/meditation, which will, for the fourth year, focus the congregation on the spirit of Holy Week. All are welcome to this free concert. Robert Honeysucker: We Will Always Feel the Spirit. His father was a Tennessee preacher of deep conviction whom the young Robert expected to emulate. But he did it through tender and thunderous singing of profound spirituality, making converts of us all. Bob died suddenly, in October, after some three-quarters of a century of total commitment to whatever he did. “It’s my life’s work to express those emotions and feelings that can only be conveyed through music. It’s how my spirit takes wing and soars to unfathomable, seemingly unreachable heights. I hope that my music does the same for your spirit, too.” The Globe wrote a memorial HERE. 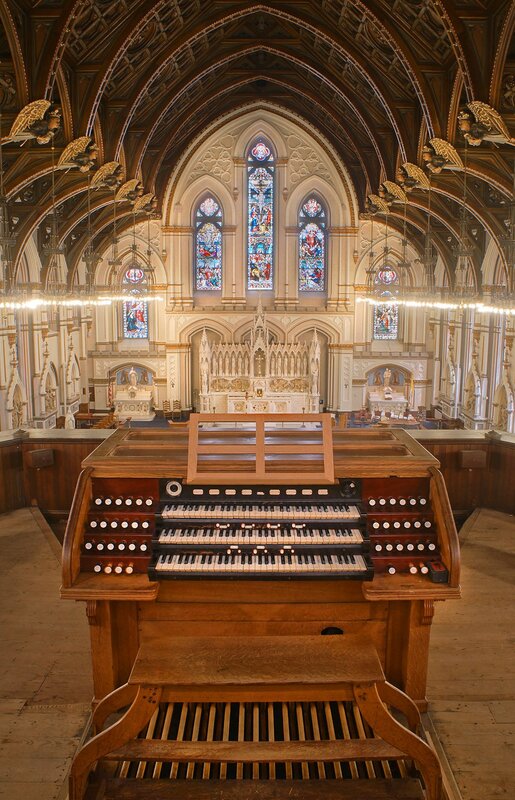 The Woodberry and Harris Organ has been in place since St. Mary’s consecration, in 1892. The firm’s opus 100 has 3 manuals, 37 stops and 41 ranks of pipes (2501 pipes). The pipework ranges from tiny tin pipes half the size of a pencil to 18-foot-long wooden giants 12 x 18″ in section. Originally the wind was supplied by a bellows (still existent) driven by a piston actuated by municipal water pressure from a 4” main. It was one of the most advanced musical machines of its day. In order not to obscure the stained-glass window at the back of the church, the organ was divided into two sections. Furthermore, the console was detached from the instrument and reversed so that it could face the front of the church. All this would have become much easier in 20 years later with the advent of electric key actions, but in 1892 such an arrangement required an extremely complex arrangement of wooden connectors, called trackers, to transfer the movements of the keys to the valves under the pipes. Because of its size and complexity, the Woodberry also required a mechanical helper called a Barker machine which, in essence, amplified the motions of the organist. Having survived unaltered for so long, the organ has weathered many changes in design philosophy, which for many years changed almost as often as the length of hemlines. Many fine instruments were discarded owing to such changes in fashion. But because St. Mary’s was blessed with an organ that continued to work so well for so long and because no one urged its replacement to satisfy changing tastes, the church is left with a remarkable survival—an instrument that is tonally quite surprisingly in accord with current practice, and one that at the same time is perhaps the most significantly unaltered historical instrument in the Archdiocese. Two years ago, Andover Organ Company accomplished a major restoration of the action and winding. St. Mary’s Parish was formed in 1828 to serve the burgeoning Irish Population of Charlestown. At the time, Bishop Fenwick noticed that his Cathedral of the Holy Cross in the center of Boston could not serve the needs of the growing Catholic Population of Charlestown and adjoining towns. By establishing a Parish near the center of the town with reasonable access to the bridge to Cambridge he could bring religious services to Medford and Malden. The new parish would be dedicated to Mary, Mother of Jesus. In 1828, land was purchased at the corner of Austin and Richmond Street (now Rutherford Ave.). The Bishop presided at the dedication on May 10, 1829. During the time of Rev. John McMahon, St. Francis de Sales was established in 1859 and St. Catherine of Siena was established in 1887. Later that year in 1887, work began on the present magnificent structure which we enjoy today. The 1200 seat Church was built by and is a design of P.C. Keely of Brooklyn, in what is known as the Tudor-Gothic style and was dedicated in 1892. The distinctive ceiling is of a hammerbeam design; above it, massive timber trusses obviate the need for columns and allow unobstructed views. The brass light fixtures are from the 1890’s and were originally designed to be used for gas or electricity because electric lighting was considered experimental at that time. Perhaps the most striking features of St. Mary’s are the stained-glass windows that line the Church. Because the colors are part of the glass, they never fade, only mellow with age. The Mayer of Munich who manufactured the windows is still in operation today and run by the fifth generation of the family. Monsignor McMahon was the brother of the Bishop of Hartford, Connecticut. It is no coincidence that both St. Mary’s in Charlestown and St. Joseph’s Cathedral in Hartford had many of the same architects, including Keely. Our exceptional Stations of the Cross were constructed by the great ecclesiastical sculptor, Joseph Sibbel (1850-1907). Sibbel sculpted many important works, including the famous statue of St. Patrick at St. Patrick’s Cathedral in New York City. Sibbel designed two identical sets of Stations: one went to St. Mary’s, the other to the Cathedral in Hartford, which unfortunately was destroyed by fire in 1956. Sibbel made a similar, slightly larger set of Stations, still in existence at the Cathedral of St. Andrew in Little Rock, Arkansas (another church built by Keely, with Mayer windows!). Chicago native soprano, Sirgourney Cook completed her graduate education at Longy School of Music of Bard College where she was named a Presidential Scholar and earned a Master of Music Degree in Opera Performance. There, she studied with Bass- Baritone, Robert Honeysucker. Sirgourney touring internationally with Jennifer Hudson for three years. Recently, she was featured as a soloist in Duke Ellington’s “Concerts of Sacred Music. She continues to use music as an avenue to inspire, educate and advocate for underprivileged youth, currently serving as the Performing Arts Teacher at Roxbury Prep. The Charlestown Community Choir was formed in 2015 by Daniel Sauceda, who is also the director. It is an all-skill level choir aimed at providing fine music to the Charlestown community of Boston, with members from its own community. The Choir has two regular concerts a year and is always looking for new members. Daniel Sauceda is a composer, conductor, and keyboard player based in the Boston area with degrees from California State University, Los Angeles and Boston Conservatory in composition. He is the director of music at St Mary’s Church in Charlestown as well as the Charlestown Community Choir.